We have attended a number of weddings this year. It has been a good year for weddings, but we may have to give up dancing. Anniversary dances have just about done us in. The anniversary dance is where married couples are invited to begin dancing. The dance floor is jam-packed with couples bumping into one another, jostling each other and having a marvelous time. Those married less than one year are asked to leave the dance floor. The crowd laughs as the amateurs exit. A little later, those married less than five years and ten years, respectively, are asked to leave. The dance floor opens up a little more. Those married less than 15 and 20 years exit and the remaining couples give them nods of respect as they return to their tables. Those married less than 25 years are asked to leave and we are suddenly conscious that we are now visible. Others may actually see our dance moves. Or lack thereof. We are the old people! They knock out those married less than thirty years and only a dozen or so couples remain on the dance floor. This is what you get for attending a wedding where nearly all of the guests are under 40. Couples eye each other trying to determine who is older. My crow’s feet look worse than hers, but she’s wearing comfort shoes. My husband has more hair than some of those guys, but some men go bald early. I wonder why the bride and groom’s grandparents aren’t out here. I know for a fact they are considerably older than we are. Oh sure, they may have just had knee replacements, but they could two-step if they wanted to. They knock out those married less than 35 years and the dance floor is sparse. Very sparse. We’re talking blue-whale and Asian-elephant sparse. The dance floor looks like the parking lot at the mall at 2 a.m. Some of the couples still dancing were married the same year we were. They had the same wedding cake with the plastic bride and groom on top and the punch fountain in the center of the cake. Don’t laugh. It was cool. They release those married less than 40 years from the dance floor. We exhale and exit. Close call. For now. The longest married couple on the dance floor has been wed for 57 years and they glow. The round of applause and gift bag is theirs. I don’t want them –the applause and the gift bag—but I’ll gladly take the older couple. What I really want is to comprehend how the years goes by so quickly. And to keep dancing. It has been an uneventful week except for Wednesday, when the chair I was sitting in collapsed. You may have heard that I am still carrying several extra pounds from my last pregnancy and that would be true. And, yes, it also would be true that the baby from that last pregnancy is now 32 and has two babies of her own, but let’s not get caught up in the numbers. I lay blame on the chair, not the woman in the chair. The chair was one of two the husband scored at an estate sale years ago. It is (or was, I should say) a small, wooden folding chair, the sort that was popular decades ago and is sometimes still used for seating at frilly romantic outdoor weddings. In my defense, both small wooden folding chairs have been used many times at family gatherings, often occupied by male relatives a full foot taller than me and many, many pounds heavier. Who knows, maybe the fellas weakened the chairs. I like where this is headed. 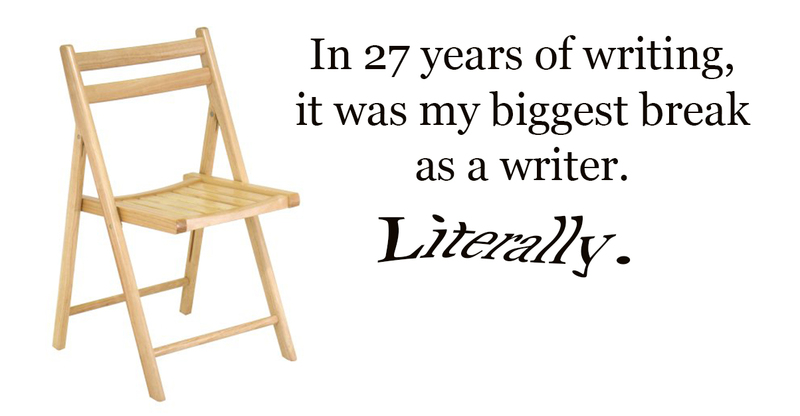 In any case, I have used one of the small wooden folding chairs in my upstairs office for two years. There I was, fingers flying across the keyboard, when I hear an awful racket and find myself on my back on the floor. It wasn’t like one support peg wiggled loose—the entire thing flew apart with wooden dowel rods, chair legs and wooden slats scattering across the hardwood floor. After helping me up, my beloved asked what I had done to the chair. Had I been bouncing on it? 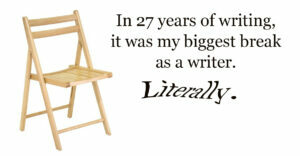 As if I often bounce up and down while I write, particularly on a small wooden chair. Had I been standing on it? As if I stand on wooden folding chairs. Ordinarily, I would object to such a line of questioning but he was as bewildered as I was that a chair could completely fall apart in every direction. I think the glue in the joints simply dried up and gave way. The husband, who would always rather try and fix something than throw it in the trash, mournfully carried the chair parts to the trash. He enjoys old artifacts that have been gently loved and have a rich history. I’m counting on his fondness for antiques to work in my favor as I age. But right now, I am working on my resume as a stunt double. A chart titled “The Age You Peak at Everything,” published by Business Insider, was sent my way and was an enjoyable read—if you enjoy waves of uneasiness that roll your stomach. Lest I sound somewhat despondent, which is possible since, according to the chart, my last Life Satisfaction Peak was at age 23 and my next one will not occur until age 69, the selling point of the chart is that growing older comes with benchmarks of contentment. Of course, there is a lot of ground to cover between youth and age with numerous peaks along the way, some of which you have probably already missed. The peak age to learn a foreign language? Age 7. Yep, that ship has sailed; bon voyage. In other bad news, your brain processing power peaks around age 18. A moment for reflection on that one. If brain processors peak at age 18, but greater life satisfaction lies beyond 18, could it be that contentment is tied to lower brain capacity? Just asking. Muscle strength tends to peak at age 25, followed by the peak likelihood of finding a marriage partner, which occurs around age 26. The sequencing of those two—peak strength followed by marriage—is entirely logical as marriage takes strength. Oh, does marriage take strength. Right, honey? The peak for bone mass is age 30, for playing chess, age 31, and for remembering faces, age 32. Your best age for the ability to focus is 43. Let’s be honest; we all know what follows peaks. Valleys. The chart does not note valleys, but it should. The chart uses a straight line marked with dots for peaks, but realistically, life often looks more like a wild EKG. For an upswing on the EKG, your arithmetic skills peak at 50. Apparently, the multiplication tables take far longer to gel than previously thought. Peak points appear increasingly sparse as the timeline progresses. There is a near dearth of activity between ages 52 and 68. If that’s where you are and it feels like a long, dry stretch, it probably is. Out of the blue, age 69 pops up as when many experience life satisfaction—again —46 years after the first satisfied life peak. The two remaining peaks are significant. Wisdom really may come with age. Psychologists gave groups of people a conflict and asked for insights, responses and possible outcomes. The oldest age group –those in the 69-90 age range—did better than the other ages on almost every count. The final peak comes at age 82 and is for psychological well-being. The 82- to 85-year-old age group gave the highest average number, which was 7 on a scale of 10. Not a bad crescendo. Not bad at all. Repeat after me: The best may be yet to come, the best may be yet to come.